We are now looking to build on our winners at the recent Festivals which were all decent prices, ranging from 2/1 to 28/1! We also had a number of E/W bets which gave us a strong return. We are aiming to make it 57 from 72 in profit. We are known as the festival kings within the industry and confidence is super high that our tips at Aintree will produce strong profits. For those who were involved in Cheltenham, York Dante, Goodwood and St Leger, just know that we will pay the same level attention to our tips at Punchestown. All tips come with in-depth analysis and no stone is left unturned. Since starting our festival specials nearly 5 years ago we are proud to boast a record of 56 profitable festivals from 71 and over 350 points profit in the process. 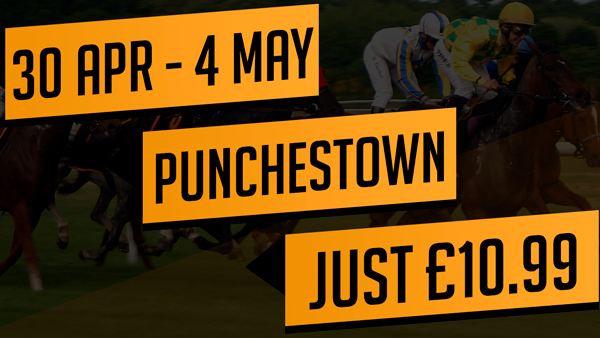 Our Punchestown Festival package is £10.99 for all five days – extensive and comprehensive coverage! Do not miss out. Don’t forget we also cover 16 festivals each year and you can pay monthly for £9.50 which gives you a saving of almost £24. You could even pay yearly for £95 and get all 16 festivals which gives you an even bigger discount. JPW Racing Tipster is back bigger and stronger this year. Our focus and confidence is high, so you are in for a treat. Don’t miss out as we will only have 200 spaces available. Note: If you already have an account, please login before completing the form below. Price listed inclusive of VAT.